A few weeks ago Oh! Nuts sent me some of their macadamia nuts and dried blueberries to try. I’ve got some ideas for recipes with the dried blueberries, but I haven’t cooked any of them yet because I’ve been drowning in fresh blueberries since we went blueberry picking at the Bush-n-Vine. I’ve been going to town with the macadamia nuts though. The bag of macadamia nuts is huge- 1 pound of the biggest, freshest raw macadamia nuts I’ve ever seen. I’m convinced that the ones I’ve been buying at my local grocery store have been sitting in a package on the shelf for years before they make their way into my house. And I’m even more convinced of that after tasting Oh! Nuts macadamia nuts. They taste like they came just off the tree, with a wonderful, fresh crunch and the macadamia nut’s distinctive, slightly buttery, but mild taste. They come packaged in a really fabulous resealable bag. 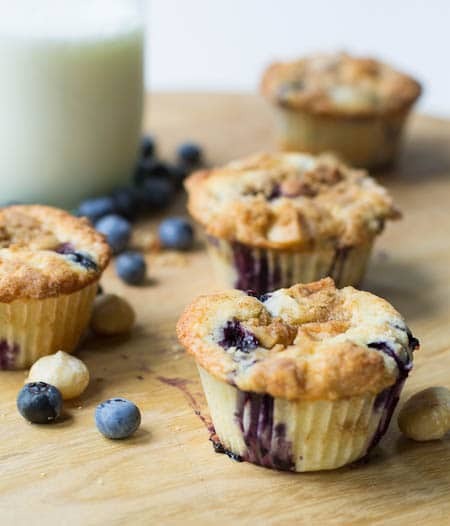 They are a wonderful addition to Blueberry Muffins when added to a streusel-type topping with cinnamon and brown sugar. 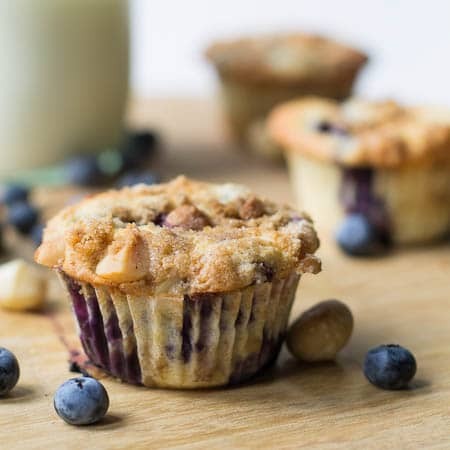 If you were to grind them, they could even be added to the batter to give the overall muffin a nutty flavor. I’ve got all kinds of ideas for this bag of macadamia nuts and I’m going to stretch it as far as I can. I’ve already added them to banana pancakes and roasted some and sprinkled them on a salad. And I’m thinking about grinding some up tomorrow night with some coconut and using them as a coating for chicken tenders. 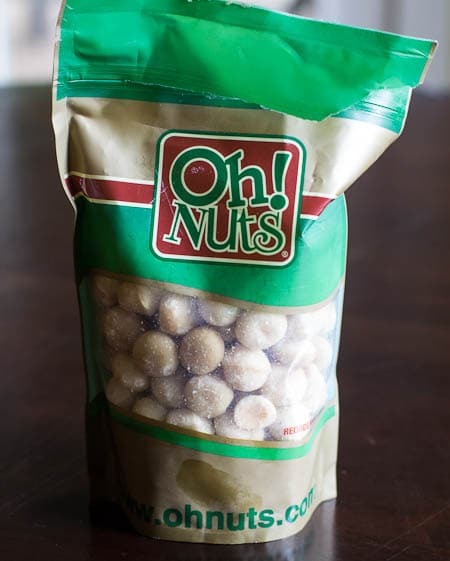 Macadamia Nuts are a really versatile nut and I love that the Oh! Nuts website has detailed information about them as well as their other products which include dried fruits, candies, granola, gourmet coffees, and much more. I think you could write a whole term paper on macadamia nuts just from the info they provide. Did you know that the macadamia nut is the only native Australian plant ever developed as a commercial food crop? Or that a mature macadamia tree can potentially produce an annual yield of 60 to 150 pounds of in-shell nuts. But it takes a period of 10 to 12 years or more for the initial costs of a macadamia orchard to be recovered. Fascinating stuff. All of Oh! Nuts’ nuts as well as their candies are kosher. Oh! Nuts really stands by their products and customers are able to review individual products on their website. Preheat oven to 375º and line a muffin pan with 12 liners. Using an electric mixer, cream together butter and sugar until light and fluffy. Add salt and beat in one egg at a time. Scrape down sides of bowl to get everything incorporated. In a medium bowl, mix together 1 ¾ cups flour and baking powder. Add to mixing bowl, alternating with buttermilk with mixer running on medium-low. Add vanilla extract. Crush ¼ cup of blueberries and stir into batter. Mix remaining blueberries with ¼ flour and fold into batter. Divide among muffin cups. To make topping, in a small bowl combine brown sugar, macadamia nuts, 2 tablespoons flour, melted butter, and cinnamon. Sprinkle on top of muffins. 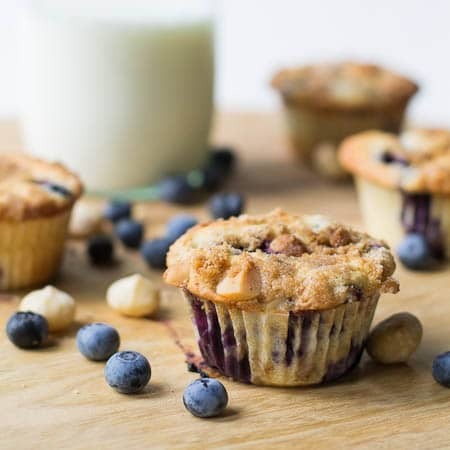 Place muffins in oven and bake for 25 to 30 minutes. 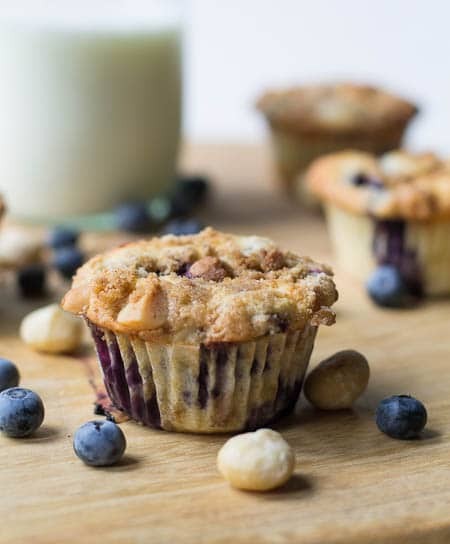 This entry was posted in Breads and Muffins and tagged blueberries, macadamia nuts, muffins, Oh! Nuts. Bookmark the permalink. I’ve never thought about the macadamia – blueberry combination. Sounds very interesting! GIRL! These look OUT OF THIS WORLD!!! Blueberries?? Macadamia nuts???? NEED. I love macadamia nuts! These look delicious. 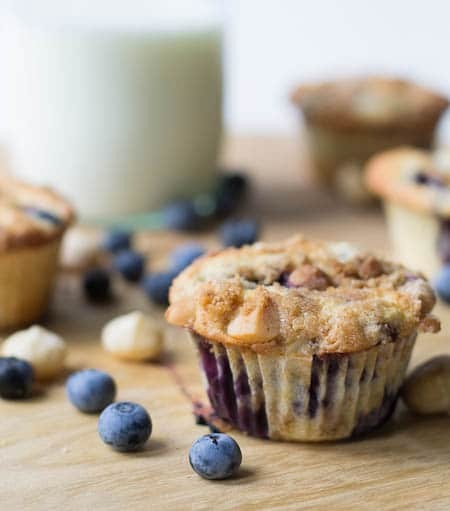 What a great idea to add macadamia nuts to these muffins, they look amazing!